On Friday, March 1, 2019, Serena S. Wilson-Griffin will present at Bristol Elementary's Black History Month celebration. Serena will speak in front of four classrooms on the theme of the month-long celebration, "Using the Past to Fuel the Future." She was selected as someone in the St. Louis community who inspires those around her by "fueling the future." 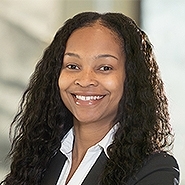 Serena practices labor and employment law in the Litigation Department. She has more than 10 years of experience advising employers on employment and labor law. Serena uses her extensive background as a former HR professional to partner with business leaders and HR professionals to reach practical and cost-effective solutions to their workplace problems.